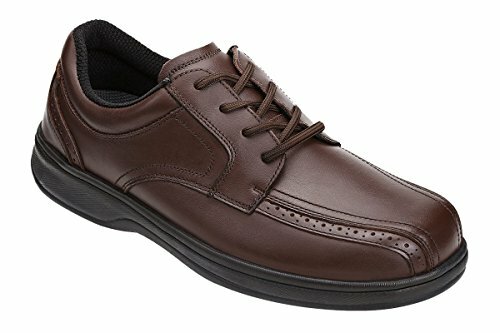 Given the strong stitching, plain-yet-classy appearance, and supreme pain-relieving properties, one would expect the Orthofeet Gramercy Men’s Orthopedic Dress Shoes to have a higher price. They deliver unbeatable value which rivals that of any other custom-engineered pain relief shoes. Regardless of your physical disability, if you suffer from any type of foot, ankle, or lower back pain, these shoes are likely to bring you relief. The results are renowned for their rapidity and the broad range of problems these shoes can help with. The Orthofeet Gramercy Men’s Orthopedic Dress Shoes both look and feel great. They’re so comfortable that anyone who spends a lot of time on their feet will soon begin to wonder how they ever lived without them. Here we’ll be guiding you through the top features of these reliable shoes designed for pain relief, while also pointing out the comprehensive array of afflictions which they will assist you with. The prime feature of these shoes is their orthotic support. An orthotic insole is supplied which gives precise anatomical support to your arch. Each shoe is supplied with two additional insoles. They come in handy for those with narrow feet, while some find more relief when using an insert. The heel is also cushioned and will adapt to the form of your foot as you walk. Not only does this lift comfort levels, but it’s also a proven means of pain relief. Advanced ergonomics ensure that pain is alleviated at the foot, heel, knees, hips, and your lower back. 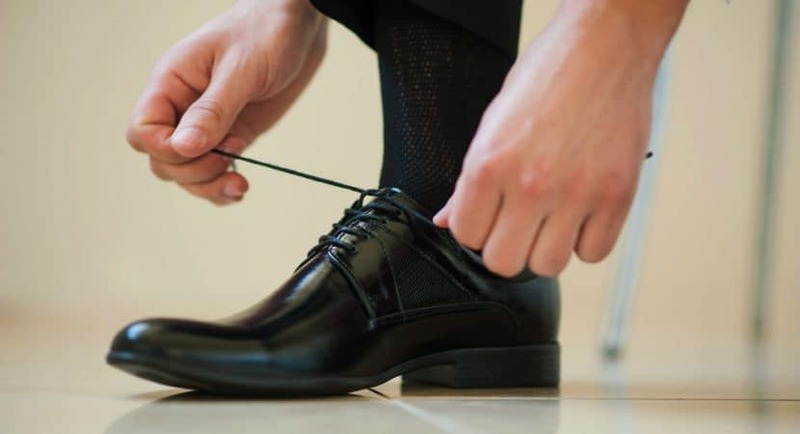 Orthofeet have integrated great features into their dress shoes. Patented Easy Gait Ortho Cushion technology incorporates air cushions into the sole of your shoe. As the product of pain-relieving biomechanical design, stress is lessened across your joints, while you are also given enhanced stability and better foot motion. Even though they are broader than normal, your feet will never slip inside your shoe. You will find that the extra-depth design is a fantastic feature which delivers a toe and upper area free from pressure. These shoes are great for those suffering from bunions and hammer toes. The interior lining is completely free from seams while the padded foam interior is designed to protect you from pressure on key points of your feet. They are a total solution for sensitive feet, diabetes sufferers, and even those afflicted with rheumatoid arthritis and neuropathy. The sheer range of conditions that they provide pain relief for is astonishing. From Morton’s Neuroma to corns, Plantar Fasciitis, Metatarsalgia, and even flat-footedness, these shoes are utterly amazing. Fortunately, the comfortable broad design does not affect sizing. As with all of its other features, these orthopedic dress shoes from Orthofeet Gramercy run true to size. If you have particularly narrow feet, then it would be recommended to purchase half a size smaller than you usually wear due to the broad layout of the design. Both the black and brown colors available are extremely versatile, while from the onset you would never know that these are specifically designed for pain relief. Contemporary, classic styling ensures that they are both functional and attractive. The Orthofeet Gramercy Men’s Orthopedic Dress shoes give pain relief and comfort which is on par with highly specialized therapeutic equipment. Most wearers report that the quality and healing benefits of these shoes are equal to high-end orthopedic solutions which can cost up to five times as much. They also give better pain relief and greater long-term benefits than even custom-design inserts or shoes. Unlike other shoes designed to supply orthopedic support, these dress shoes are intelligently designed to carry a great appearance which mimics that of a contemporary, stylish shoe. Most people wouldn’t be able to tell that you’re wearing an orthopedic shoe, whereas other pain-relief footwear products often carry a distinctive look. Most orthopedic shoes are not supplied with extra inserts. Orthofeet Gramercy supply’s two extra inserts to guarantee that all wearers find the best fit possible. With the cost of therapeutic inserts being fairly high, this is certainly a generous addition which ensures that you will have a snug fit and superior support without having to spend extra money. Most wearers of the Orthofeet Gramercy report noticeable foot pain relief within a very short time span. Some have had foot pain which they’ve tolerated for years dissipate after just three to four days use. The results will depend on your individual condition; however, most users have been happy with these shoes. These are orthopedic dress shoes that work. They give better comfort and pain relief than inserts, while also delivering a professional appearance which is versatile enough to be used in casual, semi-formal, or formal attire. If you have wide feet or experience any foot, leg, knee or back pain, these shoes are a good choice. The extra-wide design gives unparalleled ease-of-use, while countless testimonies praise Orthofeet Gramercy for the orthopedic support. The therapeutic benefits are undeniable, the pricing is affordable, and they are very versatile. If you are looking for one of the most comfortable pairs of shoes you will ever wear, give the Orthofeet Gramercy Men’s Orthopedic Dress Shoes a try. The only thing you’ll be thinking once you try them is that an extra pair in a different color would be nice.